We are not talking of President Bush Bashing, but the colloquial Australia term for driving off road. That is in the Australian bush. Most terms in Australia are colloquial. Actually, as these pictures are not from Australia. You would expect Bentley utes and beer to be in the background. 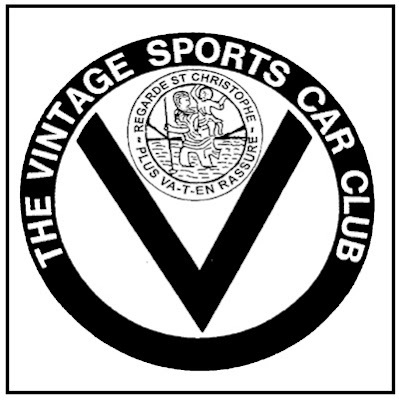 It is actually the gentlemanly behaviour conducted under the watchful eye of the Vintage Sports Car Club that is known as Time Trials. It is very British, complete with ridiculous Health and Safety, full body high viability suits, quaint little flags - and it looks bloody cold. I'm sure the winner would receive a stately sum of a pat on the back. Good going, chaps. 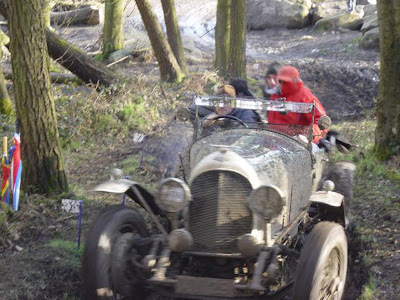 The first above is of Ben Collins, in a 1925 3/4.5 Bentley that was awarded 1st class. It was is the long wheelbase category. 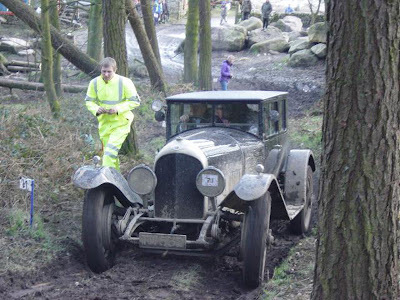 The picture has the comment 'Ben Collings with an enthusiastic group of bouncers in the Bentley' what a good way to obtain traction in the mud. His father Rodger Collins is below in a 1925 Bentley 3 Litre. He was awarded third class in the long wheelbase standard car category. He apparently was 'following in his son's tyre tracks' around the course. Guy Weatherall from Vintage Knowledge has taken many fantastic photographs of vintage cars at various trials around the UK. 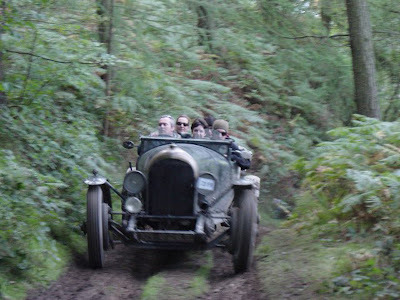 I suggest a look at the gallery of vintage cars in action here. The photograph below is from the Welsh Trials. I does look exciting!